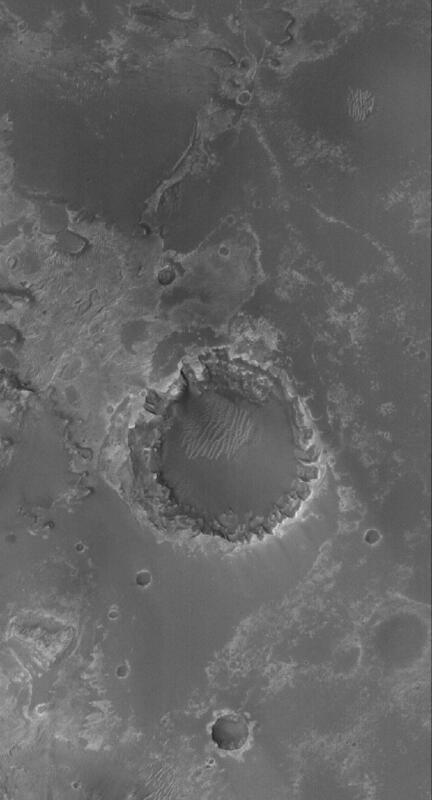 This Mars Global Surveyor (MGS) Mars Orbiter Camera (MOC) image shows a crater formed in light-toned, layered, sedimentary rocks in Meridiani Planum. This crater is located approximately 55 kilometers (~34 miles) southwest of the Mars Exploration Rover, Opportunity, site. Erosion of sedimentary rock layers around the crater rim has caused an uneven retreat, resulting in the formation of U-shaped alcoves where undermining and collapse have occurred. Dark material in this scene is probably sand and granules, similar to the dark surfaces explored by the Opportunity rover.